FCA designers, engineers tasked to build rugged truck that could drive at sustained speeds of more than 160 km/h off-road. Featuring an enhanced suspension and 37-inch tires, the Rebel TRX concept has 13 inches of suspension travel, up from the Rebel's standard 9.25 inches. 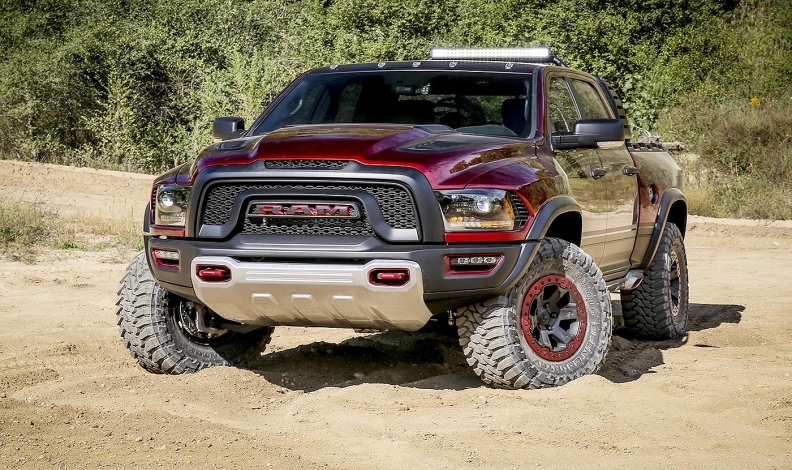 DALLAS -- Fiat Chrysler’s Ram brand introduced a high-powered, off-road concept version of the Ram Rebel, dubbed the Rebel TRX, Thursday at the State Fair of Texas. The concept pickup features a 575-hp, 6.2-liter, supercharged V-8 engine, making it the most powerful pickup FCA has ever built, the company said in a statement. Featuring an enhanced suspension and 37-inch tires, the Rebel TRX concept has 13 inches of suspension travel, up from the Rebel’s standard 9.25 inches. Jim Morrison, vice president of the Ram brand, said the Rebel TRX is just a concept at this point, but he left the door open to the possibility that it could find its way into the Ram lineup sometime in the future. Morrison noted that the supercharged 6.2-litre Hemi V-8 has more than 100 hp more than Ford’s V-6-powered Raptor. Morrison said the idea for the Rebel TRX came from brand chief Mike Manley, who challenged FCA designers and engineers to build an off-road truck that could drive at sustained speeds of more than 160 km/h off-road. The Rebel TRX has unique features, including side exhaust pipes that empty at the rear of the frame-mounted side-steps. Morrison started the truck on the stage, and it emitted a loud and clearly illegal bark. The production version would have to be quieter. Ram also unveiled a new Texas-only trim for its half-ton Ram 1500 pickup Thursday at the annual state fair in the nation’s largest single pickup market. The 2017 Ram 1500 Lone Star Silver Edition, expected in dealerships later this year, adds even more chrome trim to the brand’s Lone Star edition, including chrome wheel-to-wheel side steps, wave mesh grille inserts, belt moldings and side mirrors. The $900 US package also includes special badging and is available on crew cab models of various configurations.